Beatmania IIDX 23: Copula is the 23rd instalment of the popular Konami Beatmania IIDX rhythm video game series. Beatmania IIDX 23 retains the core gameplay introduced in the first game in the series, and builds upon features added in subsequent versions. In IIDX games, players recreate the musical score of songs available to them through the use of a DJ simulating controller. The player must coordinate their hands in order to hit the correct keyboard buttons, spin the turntable, or a combination of both in correspondence to color-coded notes that approach the judgement bar displayed on screen. Notes are divided on screen by columns which separate them accordingly to match the seven buttons and the turntable on the DJ simulating controller. As a result of hitting notes, different sounds are then produced throughout a song’s duration. Correctly hitting notes will produce an accurate musical score, while incorrectly hitting notes will produce inaccuracies and mistakes in the music. Notes fall from the top of a vertical track, and players are required to either press buttons or turn turntables as they reach the bottom. IIDX 23 introduces a number of new features and gameplay elements to this base, including a new "hell charge note", additional beginner note charts available in standard mode, an "assisted easy" difficulty mode, and various other adjustments and features. <b>Hell charge notes</b> In IIDX 17 "charge notes" and "backspin scratch" notes were introduced, where the player has to hold a button or continuously spin the turntable for a specified amount of time. Traditionally, these charge notes were effectively treated as a note at the start and end, with the end note being automatically treated as missed if the note is not held. In IIDX 23 a new type of charge note, the "hell charge note", was introduced in which the groove gauge meter would continuously drop or increase during the extent of the charge note, depending on whether it was correctly held. Additionally, with hell charge notes it became possible to recover from failing to hold the note by pressing and holding after the correct start point. <b>Assisted easy mode</b> In addition to the easy mode available on previous versions, which reduced the rate at which the groove gauge drops when notes are missed, IIDX 23 adds a new "assisted easy mode", in which the rate the gauge drops is the same as in easy mode, but the threshold for clearing a chart is reduced from 80% to 60%. <b>Class mode changes</b> Class mode is a mode in which players select from a series of preselected 4-song courses (ranked by difficulty level of the course). The difficulty level of the highest level course cleared is often used as an indicator of the overall strength of the player. In IIDX 23 several changes were made to the class mode system. First, options were added to play a class mode course with notes mirrored (mirror mode), or with the groove gauge dropping faster than normal (EX mode) or both. These options were previously available in IIDX 22, but mirror mode was selected based on whether the current day was "present phase" or "future phase", and EX mode required payment to be made using Konami's PASELI electronic currency. In IIDX 23 both options are available through normal menus. Changes to song selection menus Certain beginner charts which were previously only available in the "step-up" training mode are now available in other modes such as standard mode, under the "ALL BEGINNER" folder. Various other minor changes were made to the song select UI, including a rainbow indication for unlocked hidden tracks, and new sort options. Beatmania IIDX 23 retains the core gameplay introduced in the first game in the series, and builds upon features added in subsequent versions. In IIDX games, players recreate the musical score of songs available to them through the use of a DJ simulating controller. The player must coordinate their hands in order to hit the correct keyboard buttons, spin the turntable, or a combination of both in correspondence to color-coded notes that approach the judgement bar displayed on screen. Notes are divided on screen by columns which separate them accordingly to match the seven buttons and the turntable on the DJ simulating controller. As a result of hitting notes, different sounds are then produced throughout a song’s duration. Correctly hitting notes will produce an accurate musical score, while incorrectly hitting notes will produce inaccuracies and mistakes in the music. Notes fall from the top of a vertical track, and players are required to either press buttons or turn turntables as they reach the bottom. IIDX 23 introduces a number of new features and gameplay elements to this base, including a new "hell charge note", additional beginner note charts available in standard mode, an "assisted easy" difficulty mode, and various other adjustments and features. 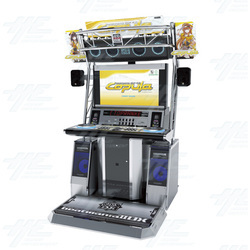 In IIDX 17 "charge notes" and "backspin scratch" notes were introduced, where the player has to hold a button or continuously spin the turntable for a specified amount of time. Traditionally, these charge notes were effectively treated as a note at the start and end, with the end note being automatically treated as missed if the note is not held. In IIDX 23 a new type of charge note, the "hell charge note", was introduced in which the groove gauge meter would continuously drop or increase during the extent of the charge note, depending on whether it was correctly held. Additionally, with hell charge notes it became possible to recover from failing to hold the note by pressing and holding after the correct start point. In addition to the easy mode available on previous versions, which reduced the rate at which the groove gauge drops when notes are missed, IIDX 23 adds a new "assisted easy mode", in which the rate the gauge drops is the same as in easy mode, but the threshold for clearing a chart is reduced from 80% to 60%. Class mode is a mode in which players select from a series of preselected 4-song courses (ranked by difficulty level of the course). The difficulty level of the highest level course cleared is often used as an indicator of the overall strength of the player. In IIDX 23 several changes were made to the class mode system. First, options were added to play a class mode course with notes mirrored (mirror mode), or with the groove gauge dropping faster than normal (EX mode) or both. These options were previously available in IIDX 22, but mirror mode was selected based on whether the current day was "present phase" or "future phase", and EX mode required payment to be made using Konami's PASELI electronic currency. In IIDX 23 both options are available through normal menus. Certain beginner charts which were previously only available in the "step-up" training mode are now available in other modes such as standard mode, under the "ALL BEGINNER" folder. Various other minor changes were made to the song select UI, including a rainbow indication for unlocked hidden tracks, and new sort options.